She Shares How The Worst Holiday Of The Year INSTANTLY Became The Best! High school is hard enough already, but add in the stress of complicated emotions and you’ve got a recipe for disaster! One 10th grade girl found herself dreading Valentine’s day. Some years, the students got lucky and the holiday happened over a weekend…most times, they found the holiday falling on an unassuming Wednesday. 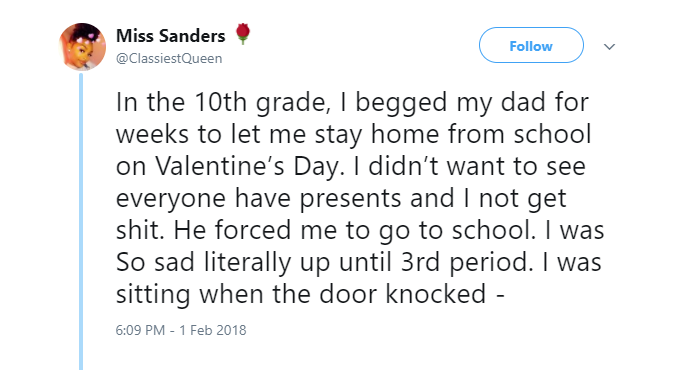 She didn’t want to go to school because she knew that it’d be a day of watching others receive roses and flowers and cards…but dad had other ideas! A delivery had arrived at her school with a giant teddy bear, a bouquet of flowers, and a box of chocolates, but she knew that they couldn’t be for her. Well, they shouldn’t have been, but when her teacher read out that the flowers were for “Miss Sunshine,” she immediately knew what was happening! Happy Valentine’s Day, love Dad. P.S. Tell everyone it was from ‘An Admirer’ ” she explained. She kept the secret, and every year that she found herself without a Valentine since then, she’s received a special present from her father! Fathers, you are your daughter’s first love. Be there. It’s so important.” She wrote. The adorable story went viral conveniently just before the holiday this year and she hopes that it will inspire parents to help make the holiday better for kids that might otherwise be left out!